March 10, 2018 WRAM Annual Conference…Save the date. Details and registration information coming soon. Save the date: Saturday, March 10, 2018. Information and registration details coming soon. Stay tuned! 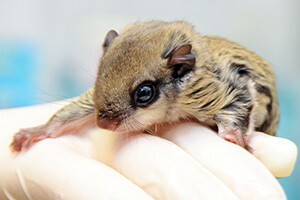 Interested in Wildlife Rehabilitation? Planning on taking the state exam? 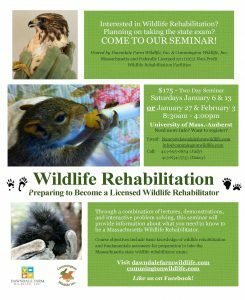 Through a combination of lectures, demonstrations, and interactive problem solving, this seminar will provide information about what you need to know to be a Massachusetts Wildlife Rehabilitator. 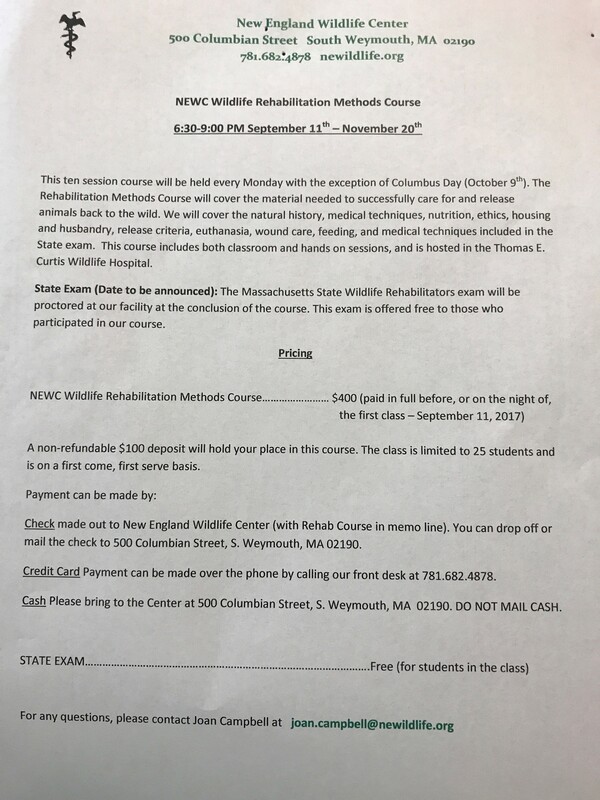 Course objectives include basic knowledge of wildlife rehabilitation and fundamentals necessary for preparation to take the Massachusetts state wildlife rehabilitator exam. Need more info? Want to register? 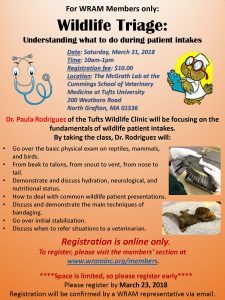 Go to NYSWRC.org for more information. SAVE THE DATE……Nov. 4, 2017. 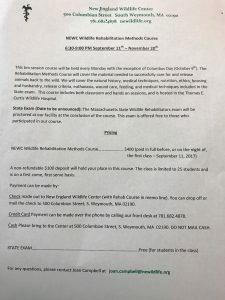 3rd annual wildlife rehabilitation workshop at Elaine Conners Center for Wildlife, Madison, N. H.
Dr. 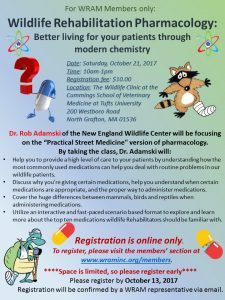 Rob Adamski of the New England Wildlife Center will be focusing on the “Practical Street Medicine” version of pharmacology. 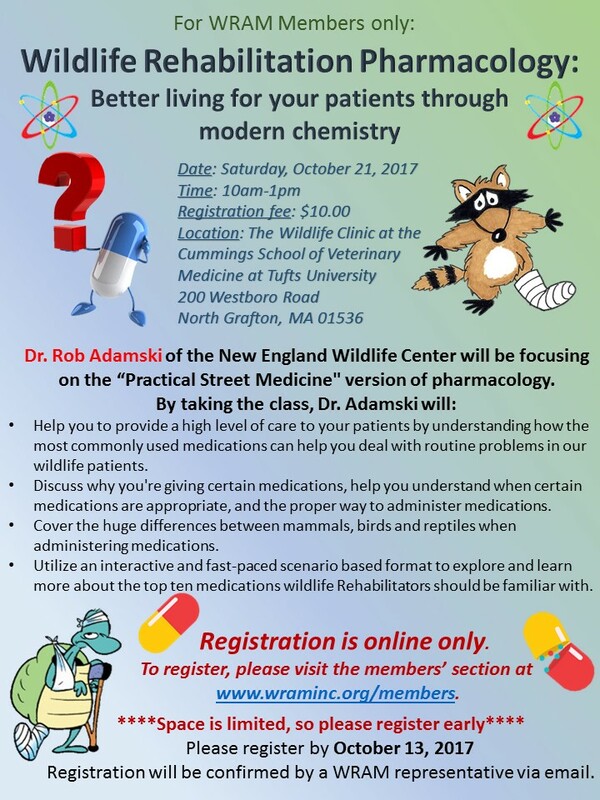 Help you to provide a high level of care to your patients by understanding how the most commonly used medications can help you deal with routine problems in our wildlife patients. Discuss why you’re giving certain medications, help you understand when certain medications are appropriate, and the proper way to administer medications. 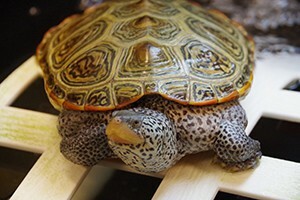 Cover the huge differences between mammals, birds and reptiles when administering medications. 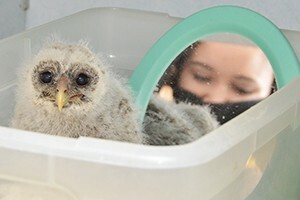 Utilize an interactive and fast-paced scenario based format to explore and learn more about the top ten medications wildlife Rehabilitators should be familiar with.